Tension springs absorb and store energy as well as create a resistance to a pulling force. It is initial tension that determines how tightly together an extension spring is coiled. This initial tension can be manipulated to achieve the load requirements of a particular application. Tension springs are designed to give a specific pull force when extended to a a specific length. 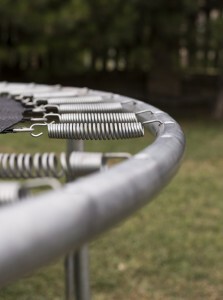 The springs on a trampoline are a classic use of tension springs. Pattinson Springs specialise in short run custom specification orders. Talk to Adam today or ask for your free quote. Pattinson Springs utilize a wide range of materials from Range 2, Range 2 Gal, zinc plated, stainless 304 and 316, music wire. All wire used has been manufactured to Australian standards. Pattinson Springs produces tension springs for wide variety of applications and industries. Our springs see use in applications ranging from industrial robotics, trampolines, door locks, and electronic applications. Tension Springs are one of the most commonly recognized spring and their applications range from small precision technology to industrial scale application. 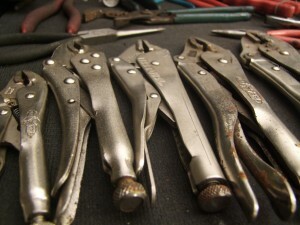 For example tension springs are commonly used garage door assemblies, automotive interiors and exteriors, vise-grip pliers, carburetors, trampolines, washing devices, farm machinery, toys as well as thousands of other mechanical uses. Tension springs come in a wide array of sizes, applicable for small precision robotic devices to off-road machinery brake springs and industrial presses. An Australian owned and operated family business located in Caringbah, NSW. Proudly making Australian Springs since 1979.